Hartung Book Two: Apple Blossoms The pattern has a wreath of apple blossoms around a central blossom. Seen mostly in marigold ruffled bowls that sell in the $10 to $20 range. The scarce rosebowls are valued about the same. In 2004, a ruffled bowl in yellow amber brought $13 at a live auction. In 2013, a 7 inch ruffled bowl in amethyst sold for $20 at auction and another for $10 in 2016. Don't confuse Apple Blossoms with another Dugan pattern, Apple Blossom Twigs. 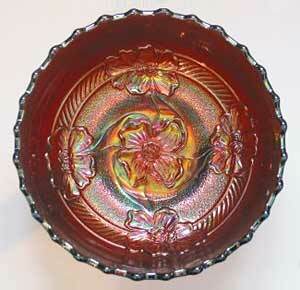 An unusual shape and color for Apple Blossoms, this deep round bowl in amethyst sold on eBay in 2006 for $24. Writing in the ICGA Pump of March 2007, Dr. Lary Keig notes that this pattern and Golden Grape were produced in the final years of glassmaking at the Indiana, Penn., plant, Apple Blossoms and Golden Grape are among Diamond's least heralded patterns. Neither pattern is considered desirable by many collectors because they are simple in design and often a light marigold and iridized poorly. Yet, there is information on both patterns that is not widely known or that has been underreported. Since I've always thought of the patterns as related, I've chosen to write about them in a single article, noting similarities and differences where it seems appropriate. Both patterns were produced only in relatively small bowls and rose bowls, in great quantities in marigold but in much lesser amounts in other colors. Bowls were crafted into two shapes; most are eight-ruffled, but some are round and relatively deep. The ruffled bowls are about seven inches in diameter and stand about two inches tall. The top diameter of the round bowls is usually around 6.5 inches, and they are slightly over two inches in height. The rose bowls have a top diameter of about five inches and stand about 2.5 inches tall. All shapes have fluted top edges, although the flutes are more pronounced on the round bowls and rose bowls than on the ruffled ones. The bowls and rose bowls in each pattern appear to have been produced from the same mold. Diamond's Apple Blossoms and Dugan's (or Diamond's as well as Dugan's) Apple Blossom Twigs patterns are, as nearly every collector knows, much different in their designs, but sometimes incorrectly identified in auction listings and reported in price guides. Misidentification like this has, on occasion, led to confusion over the shapes and colors in which Apple Blossom was made. In Apple Blossoms, the flowers cover about the inner two-thirds of the interior surface of the bowls and rose bowls. Four small apple blossoms are attached to a three-quarter-inch double band that is filled in with diagonal lines. The band extends outward from above the marie. In the center, inside the marie, is a single large blossom. Most of the patterned area is also stippled. The outer surface of all pieces is unpatterned. Marigold ruffled bowls are plentiful, offered frequently for sale at shops, shows, and on eBay. Round bowls and rose bowls in marigold are seen much less often. Bowls in both shapes, though not the rose bowls, are also known -- but are scarce or rare -- in amethyst and pink with marigold overlay (iridized pink After Glow). One in lavender slag sold in 1998 for $240. Another, in what was described as a "yellow-amber" sold at auction in 2004; it may very well have been an off-shade of marigold, given that it sold for only $13. In his impressive book, Dugan & Diamond Carnival Glass: 1909-1931, Carl O. Burns indicates that Apple Blossoms was also produced in cobalt blue. I have not seen one and have no record of any selling, so I suspect the one that's illustrated in Mr. Burns's book is actually amethyst with bright blue highlights. Bowls are also rumored to exist in white and green, but neither has been confirmed, to the best of my knowledge. Diamond's Golden Grape is similar in many respects to, and is sometimes confused with, Vintage patterns produced by Dugan, Fenton, and Millersburg. Golden Grape, however, is found only on small bowls and rose bowls (not plates), has no grapes or leaves "dead center," and has no exterior pattern, characteristics which help define the Vintage patterns. Three clusters of grapes and three large leaves, encircled by a border of tendrils, cover the inner half of the interior surface of pieces in this pattern. The alternating grape clusters and leaves extend inward toward the center, leaving little of the center unpatterned. The outer half of the interior has been left unpatterned. In this respect, Golden Grape is similar to other Diamond patterns -- like Malaga, Cosmos Variant, and its Apple Blossoms counterpart. 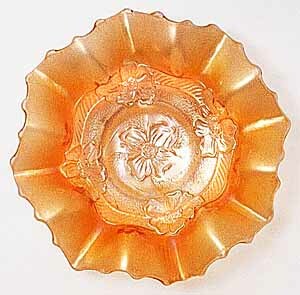 Eight-ruffled marigold bowls are by far the most common shape, frequently offered for sale in shops, at shows, and online. The marigold round bowls and the rose bowls are seen much less often, the former actually scarcer than the latter. Also known is a ruffled bowl with gold decoration. It is pictured on Dave Doty's website.